The pancreas is the organ, which is about six inches long and is placed in the abdomen in the back of the stomach, and in front of the spine and aorta. The pancreas is divided into three areas: the head, the body, and the tail. The head of the pancreas is positioned on the right side surface of the abdomen facing/adjacent to the duodenum, On the left side/surface of the abdomen is the tail, and the body of pancreas rests between the head and the tail. There are two operative portions to the pancreas, described as the exocrine and endocrine parts. The bulk of the cells of the pancreas produces digestive fluids which hold the enzymes necessary for digesting food in the intestine. The enzyme . are discharged into smaller receiving ducts within the pancreas (side branches). The side branches empty into a larger duct, the main pancreatic duct, which releases into the intestine via the papilla of Vater in the duodenum. During passes through the ducts, bicarbonate is combined with the digestive enzymes to produce the pancreatic secretion alkaline. The cells and ducts producing the digestive fluids comprise the exocrine part of the pancreas. Right before the main pancreatic duct enters the duodenum. It typically mixes with the common bile duct that collects bile (a fluid that helps to digest fat) produce by the liver. The common bile duct normally joins the pancreatic duct in the head of the pancreas. The union of these two ducts from the ampulla of Vater which exudes both the bile and pancreatic liquids into the duodenum through the pillar of Vater. Buried within the tissue of the pancreas, primarily in the head, are a small collection of cells, called the Islets of Langerhans, The cells of the Islets produce several hormones. For example, insulin, glucagon, and somatostatin, that are released into the blood I the islets do not join with the pancreatic ducts) and travel somatostatin, that is released into the blood ( the islet does not connect with the pancreatic ducts) and travels in the blood to other parts of the body. These hormones have consequences throughout the body, for example, insulin, which helps to regulate blood sugar levels. The hormone -secreting portion of the pancreas – the Islets – the endocrine part of the pancreas. Different types of cyst contain different types of fluids. For example, pseudocyst that develops after an attack of acute pancreatitis contains digestive enzymes such as amylase in high concentrations. Mucinous cysts contain mucus ( proteinaceous fluid) created by the mucinous cells that from the inside lining of the cyst. 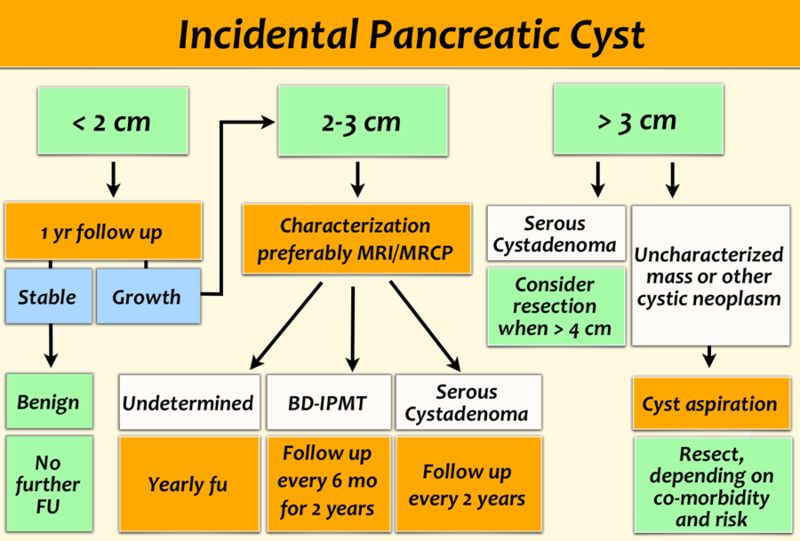 The symptoms of pancreatic cysts varied depending on their location and size. Small cysts (less than two centimeters) usually do not cause symptoms. Large pancreatic cysts can cause abdominal and back pain, presumably by exerting pressure on the surrounding tissues and nerves. Small or large cyst in the head of the pancreas also may produce jaunce ( yellowing of skin and eyes and darkening of the urine) because there is obstruction of the common bile duct. (Obstruction causes bile to back up, forcing bilirubin (the chemical that causes jaundice ) back into the bloodstream and focus it to excreted from urine. If the cyst becomes infected, your may experience spies, chills, and fevers. In rare cases, large pseudocyst can squeeze the belly or duodenum leading to difficulty in the movement of food in the intestine, leading to vomiting and abdominal pain. If a cysts become malignant and begin to invade the surrounding tissue, it may result in a certain amount of pain. Like pancreatic cancer, pain that usually form from contact via the back and upper abdomen. What are the Causes of pancreatic cyst? There are two distinct types of a pancreatic cyst, pseudocyst (inflammatory cyst) and true cysts (non-inflammatory cyst). The inflammatory cyst is benign, whereas none-inflammatory cyst can be benign, precancerous or cancerous. 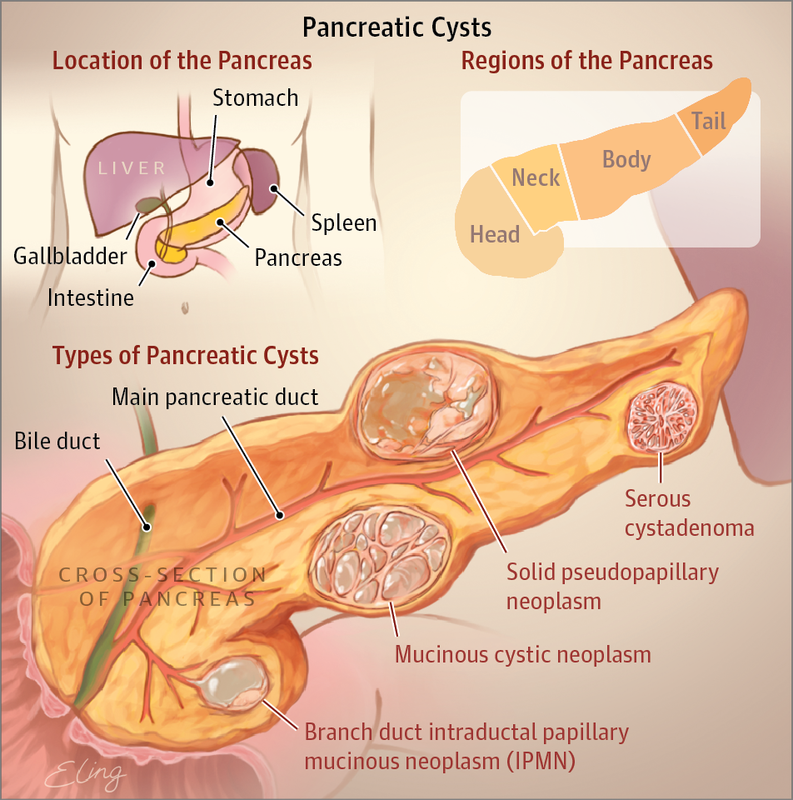 Most of the inflammatory cyst of the pancreas are pancreatic pseudocyst. Pseudocyst of the pancreas result from pancreatitis (inflammation of the pancreas). The common causes of pancreatitis include gallstones, alcoholism, trauma, and surgery. The liquids inside the pseudocysts comprise liquefied dead pancreatic tissue, cells of inflammation and a high concentration of digestive enzymes that are active in pancreatic exocrine secretions. Many pseudocysts have attachments within the pancreatic ducts.) Most pseudocysts caused by acute pancreatitis resolve automatically (without treatment) within several weeks. Pseudocysts that require treatment are those that continue beyond six weeks and are producing symptoms such as pain, becoming a barrier of the stomach or duodenum, or have become infected. Serous cyst adenomas: These are primarily benign and regularly occur in middle-aged women. They ordinarily are located in the body or tail of the pancreas. They are tiny and generate no symptoms although seldom they may cause abdominal pain. Mucinous cyst adenomas: Thirty percent of these type cysts comprise cancerous cells, and those that do not contain cancer are recognized as precancerous. They also usually occur in middle-aged women and are often located in the body or tail of the pancreas. 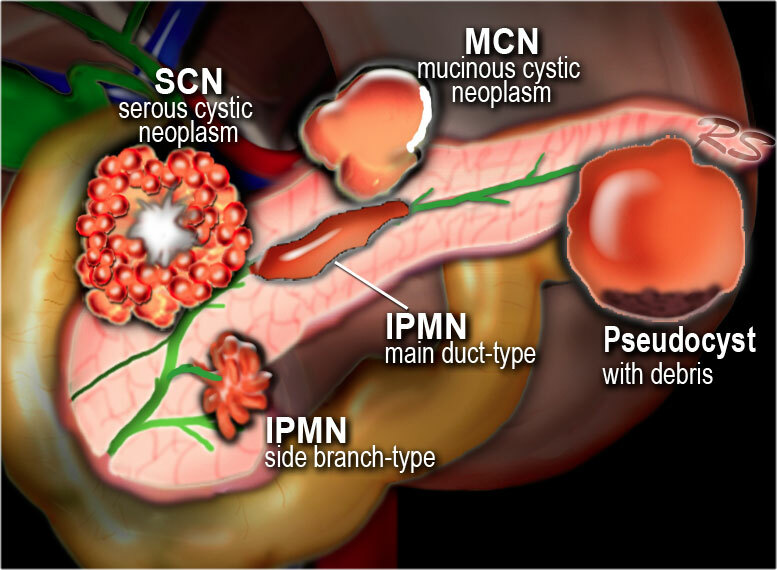 Intraductal papillary mucinous neoplasm (IPMN): These cysts have a high probability of remaining or growing cancerous. At the time of diagnosis, there is a 40% to 50% possibility of the cyst already being cancerous. These cysts are more prevalent in middle-aged men and are more commonly located in the head of the pancreas. The cysts typically generate large quantities of mucous which sometimes can be observed emptying out of the papilla of Vater at the time of endoscopic retrograde cholangiopancreatography (ERCP), a test that conceptualizes the ampulla of Vater and the pancreatic duct. These cysts can induce abdominal pain, jaundice, and pancreatitis. 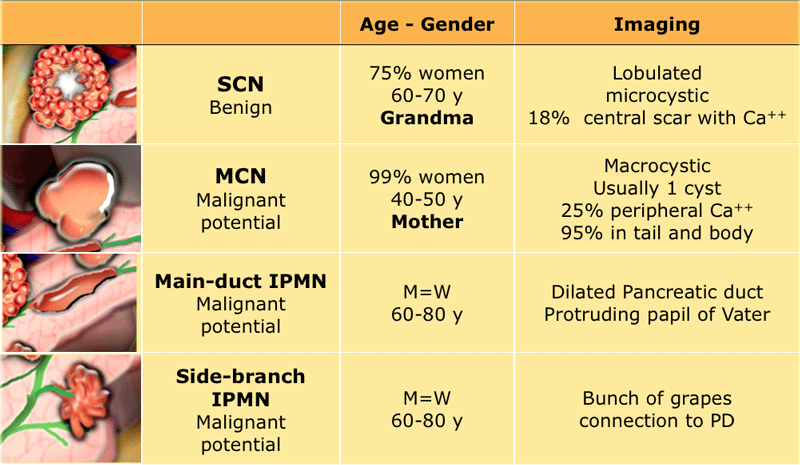 Heightened risk for cancer transpires with older age of the patient, presence of symptoms, the involvement of the main pancreatic duct, expansion of the main pancreatic duct over 10 mm, the appearance of nodules on the surface of the duodenum, and size over 3 centimeters for side-branch IPMN. Solid pseudopapillary tumor of the pancreas: These are uncommon tumors that have both cystic and solid elements and are located principally in younger Asian and black women. They may reach a large size and can become malignant. Prognosis is positive after complete surgical removal of these tumors.